(Ocean Springs, MS) – Ocean Springs Chamber of Commerce-Main Street-Tourism Bureau is calling all volunteers for the annual Peter Anderson Arts & Crafts Festival presented by Blue Moon to be held on Saturday, November 4 and Sunday, November 5 in downtown Ocean Springs. Each year, volunteers join us in welcoming more than 400 artists and crafters and nearly 150,000 visitors to Ocean Springs and the Mississippi Gulf Coast for the annual festival. Known as the largest fine arts festival in the state of Mississippi, this festival serves as an economic driver for the community and a quality event for those who live and work here on the Mississippi Gulf Coast. “We couldn’t produce this nationally acclaimed event without our volunteers” says Cynthia Dobbs Sutton, executive director of the Ocean Springs Chamber of Commerce-Main Street-Tourism Bureau. Those interested in volunteering can sign up online at www.peterandersonfestival.com by clicking on the “volunteering” table. Volunteer positions include working the information booths, artist hospitality, set-up, entertainment area, children’s art contest area and more. Sign up now through October 30. All first-time volunteers will be invited to a volunteer orientation session before the festival. 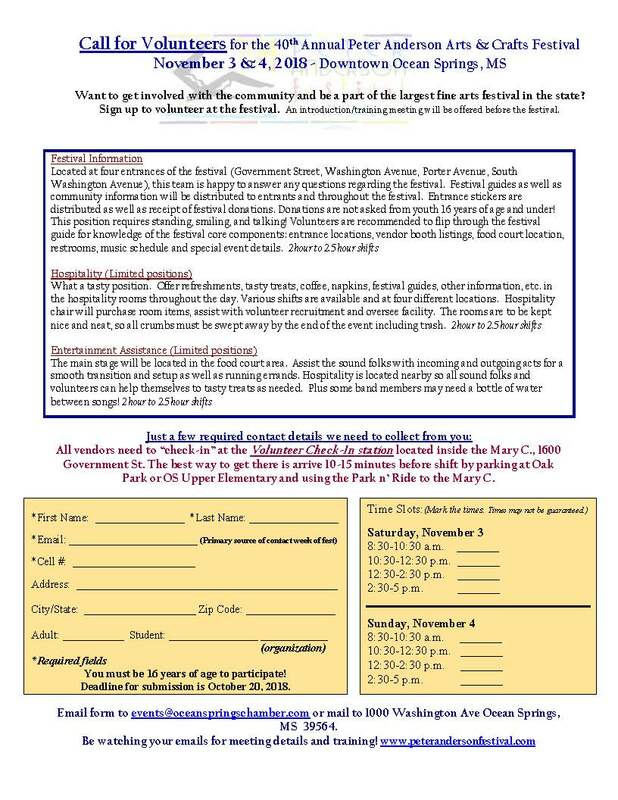 If you are interested in joining the fun during festival weekend on November 4 & 5, visit www.peterandersonfestival.com to download a form or give us a call at 228-875-4424.